File No. 08923 is my 25th painted mini for BMG, so a small milestone of sorts. I guess he is an enemy from one of the Arkham video game series, but cannot confirm that as I don't play the games. After finishing Ozymandias, I wasn't sure I would paint another BMG mini in July, but this one just seemed to progress over a few days. The painting started off one way, before I had a change of mind about the clothes/fabric colours and had to over-paint what I had done there. It wasn't until I had started that I saw I was not going to be satisfied with the colour choice I had made hence that change. I don't think it is a great sculpt because of how some of the musculature has been rendered. I am not a sculptor so I acknowledge I don't have the skill to create anything like this, but I think as a hobbyist i can comment on what I see and I do think it has flaws. Worse still was the casting which had quite a rough feel on some parts of the 'skin' areas. There was also a challenging mould line that was prominent across the head where detail was shallow and which I was not entirely able to remove due to the details being so fine. In BMG, File No. 08923 is a Henchmen that is part of the Arkham Lunatics pack with Zsasz that can be used by pretty much all the bad guy crews except where they have their own restrictions (like Court of Owls currently do due to their only Leader choice). It is a character I do not envisage me using unless its rules get over-hauled. It is ham-strung by 2 rules: one which prevents all Recovery rolls, meaning its decent Endurance value does not go very far; and another which heavily limits how it moves, and forcing attacks against models in base to base regardless of whether friendly or enemy. Basically for 20 Reputation I see much better options available. 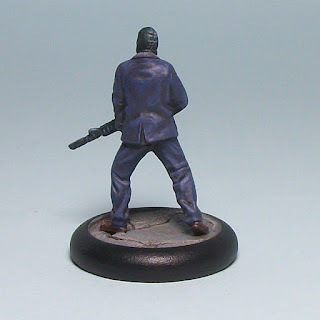 Well I seem to have inadvertently broken my streak of painting one Watchmen character each July! Don't expect the final two imminently though! 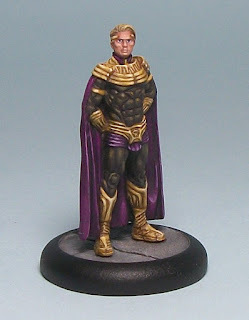 I started Ozymandias as I was finishing Nite Owl and did the bulk of the work in stints over two weekends, only finishing him once I had completed work on Mesh and Prisoner 01. That said, start to finish was a little over a week. I am fairly pleased with how he has turned out, and I think it was a case of right model, right time, while I have some painting momentum - I almost enjoyed painting him, which is to say I don't really enjoy the painting process, but do like having finished models to hand. 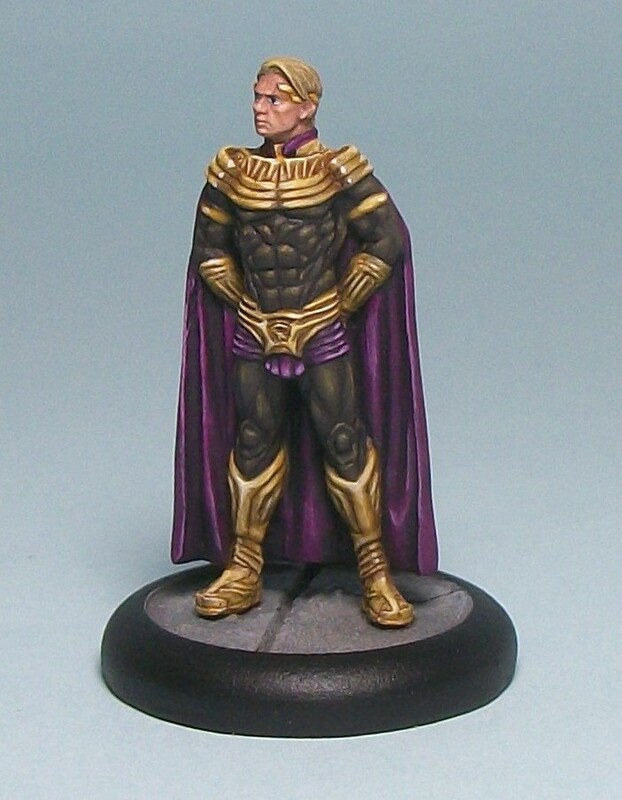 Despite not finding the painting process ttoo arduous for this mini, and accepting I don't plan to finish Comedian or Silk Spectre any time soon, I do like the idea of playing a Watchmen crew in the future, and technically I have a 225 Reputation crew ready with Ozymandias, Nite Owl and Rorschach, but I feel it is better to play them in full as key stuff like Comedian's ranged threat would be missing. 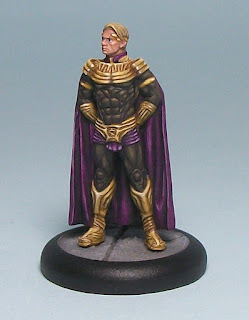 In game terms Ozymandias looks like he is quite a contrast to what I am used to, having very high Defense (I am used to most of my models being easy to hit with Defense 2) coupled with Martial Arts (to counter being outnumbered in close combat) and Acrobat which allows him to Dodge ranged attacks, with a re-roll from Reflexes, giving him something like 89% chance of Dodging successfully if my assumption of probability is correct. I could imagine that if used right he could tie up multiple models by weathering a number of futile attacks, while being potent enough to KO lower-Defense Henchmen without assistance. 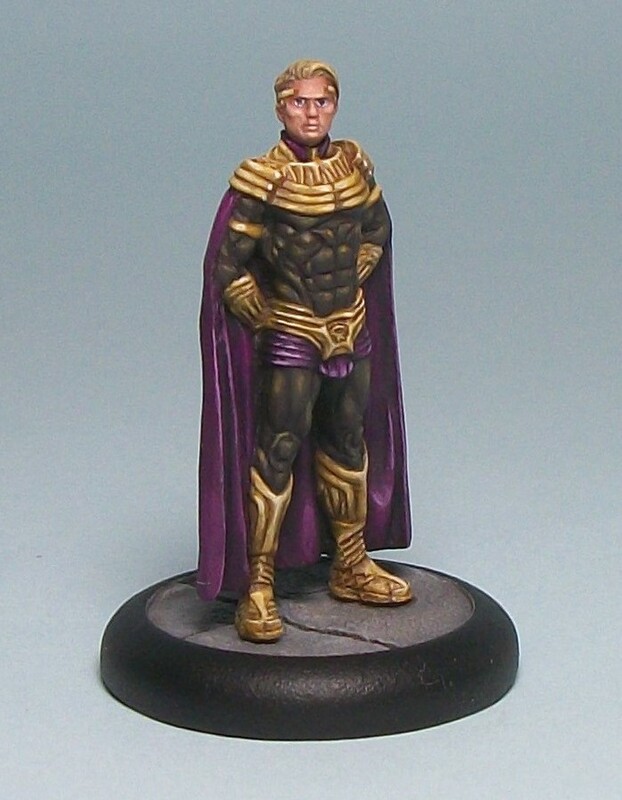 In addition to his combat abilities, Ozymandias offers some game management options with Mastermind (helping with Take the Lead) and Great Strategist giving extra Strategy points. So if and when I do play Watchmen, they will be interesting. My BMG productivity continues, although truth be told I started painting this mini quite a while ago, either at the same time as the Clown, or more likely even earlier when I started Turk. In other words, it has taken quite a while to get finished from first base-coats. That is often how I paint, starting things and losing momentum. 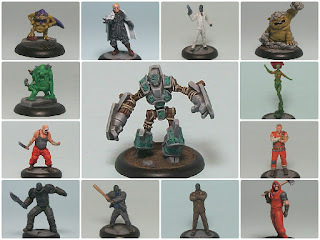 Games and gaming serve as a useful spur to painting for me at times, and finishing this was with a game in mind, and of wanting to try out a new crew line-up. 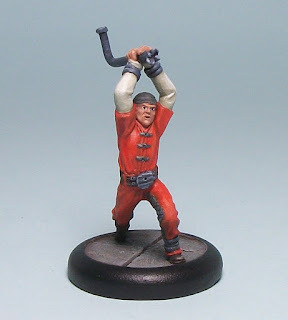 As one of the cheapest models in terms of Reputation in the game, Prisoner 01 was the ideal final addition I needed, and has pushed my total of BMG minis on further. All that said, the final painting result is definitely a bit on the scrappy side, but I have no enthusiasm to try and make it look better, so I can live with how he has turned out. I am most glad that he is now out of the dread 'paint queue' as he had been hanging around as I said above. It doesn't help that as before, my highlights are washed out when photographing the mini. 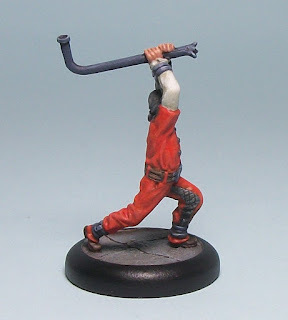 Individually the model is fairly weak in game terms, as his Tube weapon is not too threatening (basically the same as Goon 2's Baseball Bat, but Prisoner 01 is cheaper in Reputation terms) but I expect him to back up a heavier-hitting ally or two, or just grab Loot and smuggle it away. He doesn't offer much threat alone, but when ganging up with another model, especially if Activating first, he can enhance the ally's chance to hit in close combat. Basically he is going to be included because he is cheap - where I cannot afford the reputation for a more expensive Henchman. I am planning to try a few different crew line-ups in the next month or two, and Prisoner 01 will give me a little leeway to include more expensive Henchmen or Free Agents. 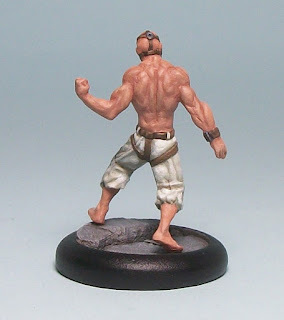 I am now at a point where I have one more part-painted BMG mini which I would like to finish soon, and maybe paint another Free Agent (Hush as I like the idea of including him in a Poison Ivy crew), before focusing on other ranges a lot more. 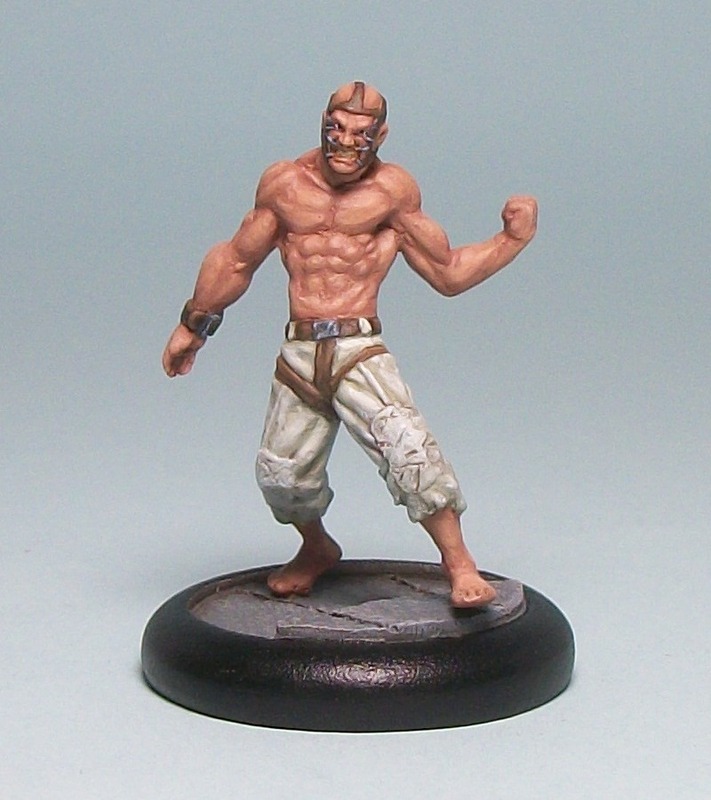 So after those, if they get done soon, I don't expect too much more BMG painting from me this year, but you never know, especially as my losing/drawing streak continues and I am still striving to find a satisfactory combo of minis for my crew. The painting was done in a few brief, quick sessions over consecutive evenings, and I was surprised at how quickly I finished the mini especially in light off having managed to finish around 10 BMG minis over a period of 8 or so weeks, especially finishing this hot on the heels of painting Nite Owl. Action Counters for Maximum Attack: 2 AC for Mesh/4 AC + 1 SC for Turk! The second quarter of the year saw a drop off in painting output from me, which was partly due to making the Fabled Realms buildings that I mainly did in April and May. 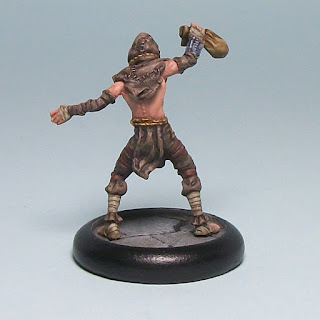 I was hoping to paint 16 minis in the quarter and managed 13, so some shortfall to catch up going forward. On the plus side, I was still more productive than the same period in 2014! 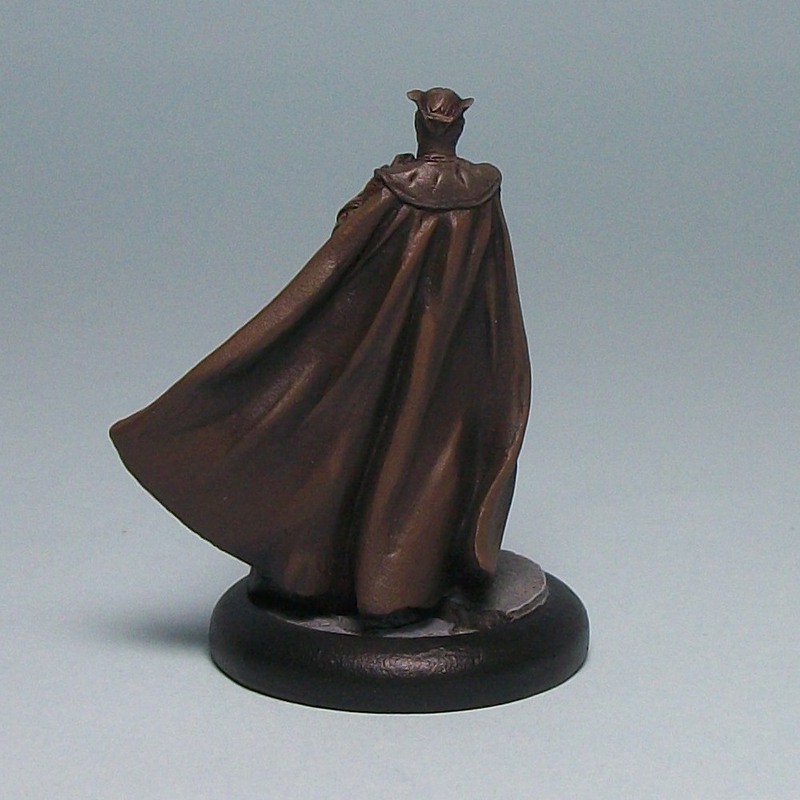 I am on course to meet my 'bare minimum' of 50 minis over the year, but I need to step up to hit my ideal of 68. My Anima Tactics target will not be met, but I have far exceeded what I hoped to get done for BMG. 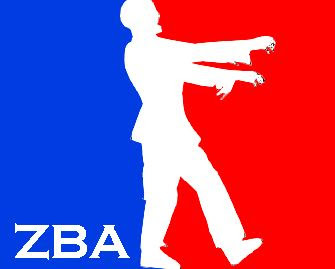 I have every chance of painting what I want and more for Pulp City, and Zomtober always gets me through a few Zeds! 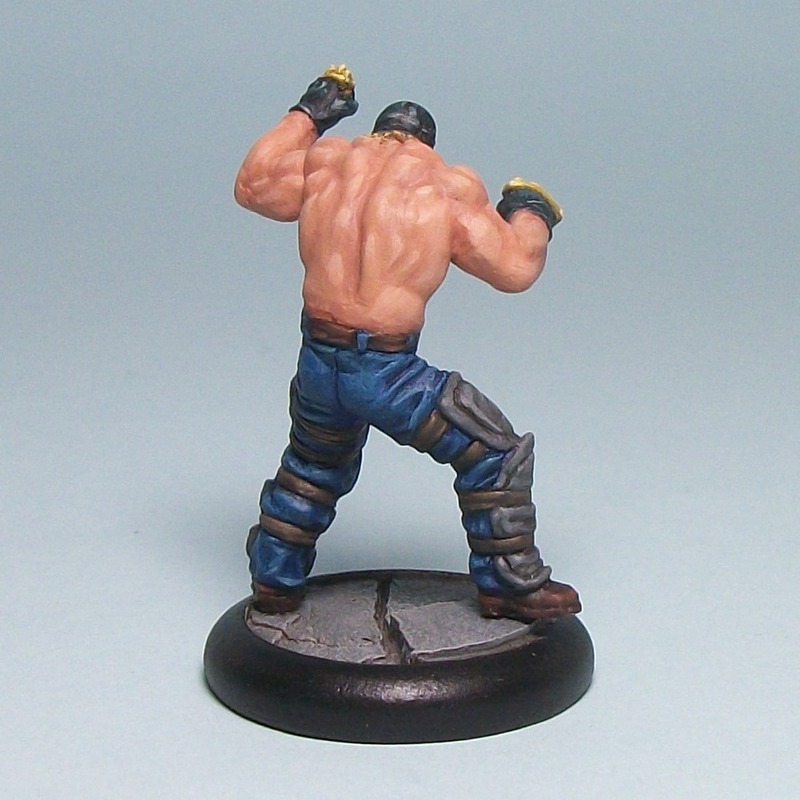 July has started well with 4 minis finished as I write this (one not yet posted, maybe more by posting time! ), so it would be nice to get a few more done this month. 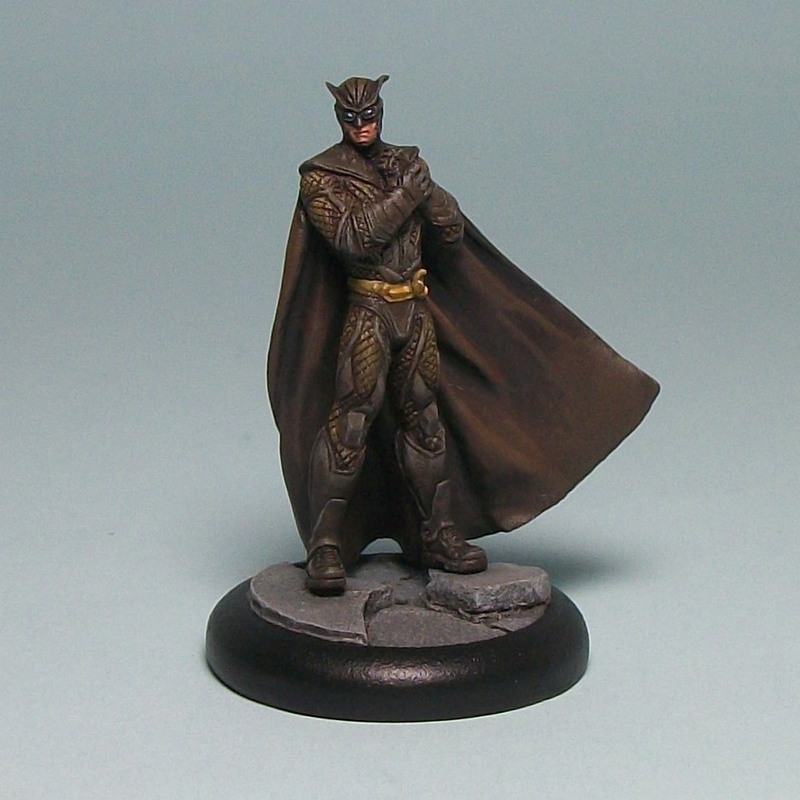 My second Watchmen mini, and like Rorschach, Nite Owl was painted quickly by my standards, in around 2-3 hours over a few short sessions. I had some sudden impetus last weekend after finishing Scarecrow and Mule Goon and decided to take advantage of it! The palette is very muted and limited, with primarily 3 variations of brown, and I tried to echo the movie incarnation to an extent, within my own limitations as a painter! In all it is not perfect but it will do for me, and it is pleasing to have painted a few minis already in July after paltry output in March and April, and it has also put me way ahead of my 2015 target for painting BMG minis. While I think it could be quite a while before I have a playable Watchmen crew, the characters look quite interesting and varied in rules terms, although I suspect each will have unique learning curves, and that the two least powerful fighters (Nite Owl and Silk Spectre based on Damage output) will require the most learning. One gripe to note - for some reason my casting does not have the scale armour on the outer left thigh, which I think is either down to the sculptor forgetting to do so or Knight Model's casting - either way a crass quality control error for a mini with a premium price point. I would welcome comment from anyone else with the mini if theirs has/had the same issue. Moving forward for BMG, I do want to get Mesh painted, and maybe Hush too, for my Black Mask and Poison Ivy crews respectively. After that I may rest my BMG painting to concentrate on other stuff, but time will tell! 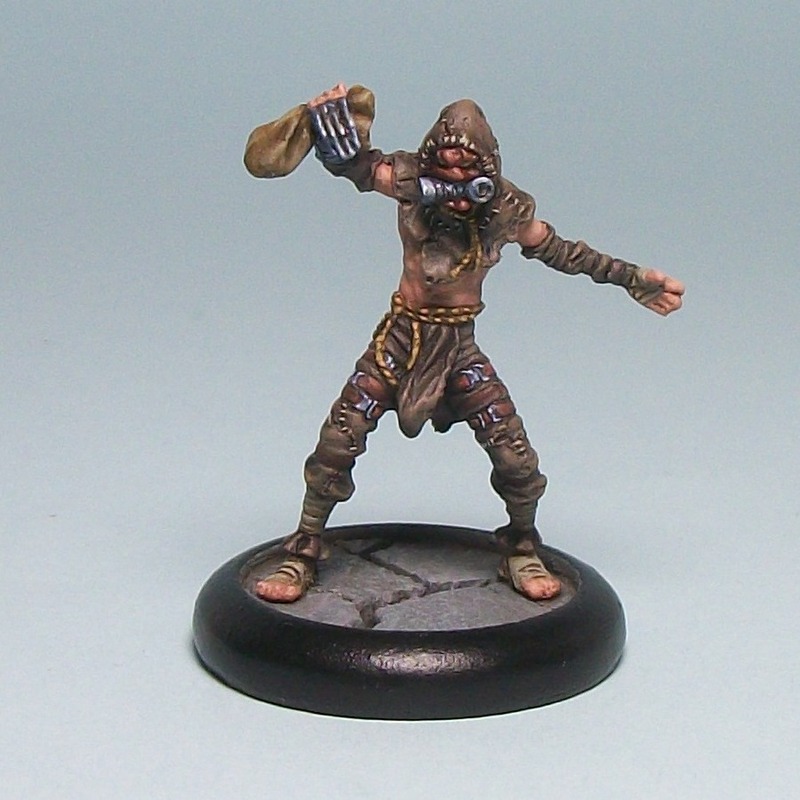 Another Black Mask Henchman done, and this is the first that is intended to refresh the crew. To fit in Mule Goon and Arkham Scarecrow I will be dropping the Riddler and Goon 2 for the same overall Reputation cost. With Will 5, Endurance 7, Sturdy and Veteran, Mule Goon should prove pretty durable, although I suspect maybe not as tough as Anatoly since he lacks any kind of armour. His very decent Endurance means he has a 58% chance per Round of recovering from KO; by contrasts an Endurance 5 model has 28% chance, while Endurance 4 has 17% chance. Basically Mule Goon has a very good chance of recovery and thus getting back in the game if not removed as a casualty (see bottom of post for a probability breakdown). Durability is one thing, and the chance to do 4 Attacks with a 2 Stun weapon is how Mule Goon threatens. Again, better than the 1 Stun per model output from some cheaper models like Goon 2. As for the model, as it shares a lower half with Anatoly, again the main hassle was hacking off the lump of metal Knight Models used to make the minis' overhanging feet fit to a 30 mm base. The painting progressed pretty quickly by my standards, which was nice, as it gives me a good start for the month, and I am pretty pleased with how he turned out. I declined trying any tattoo work as I could not imagine a good outcome of me trying that at this time. 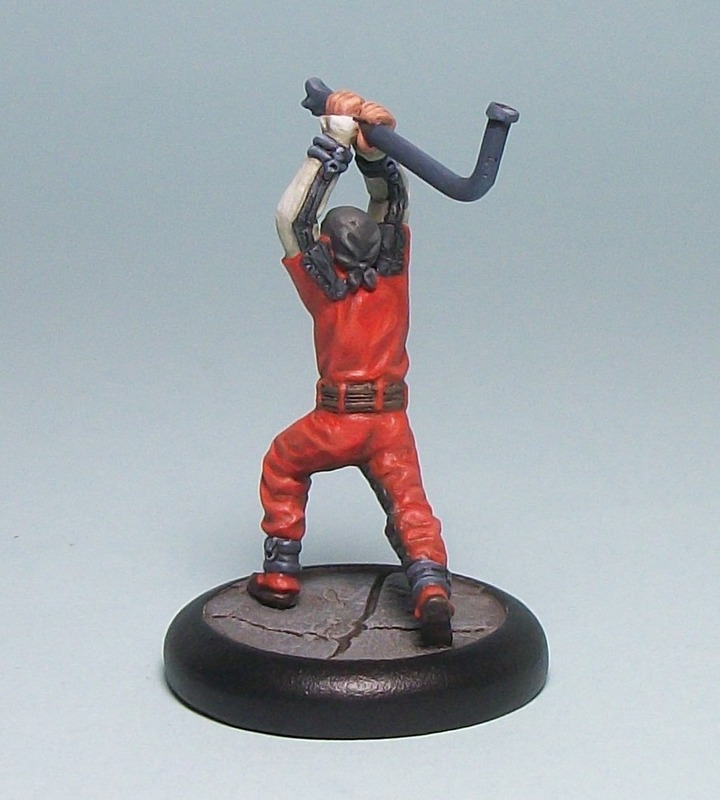 As usual, the mini is based on a Dragon Forge 'Fraktured' style base as are all my BMG/DC minis from Knight. The refreshed crew just needs Mesh adding to it, and then it will be as I want it for the time being. I wish I could take Hush, but alas he is limited to only a few crews. And Scarecrow is done! 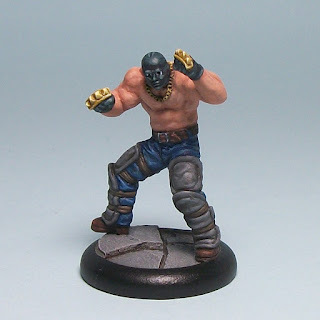 This mini has been sitting part-painted for quite some time, but my recent tournament experience made me resolve to finish it, pushing me forward on my BMG productivity. This is Arkham video games version and not the classic comics Scarecrow, but nonetheless I like the raggedy-ness of the design, so it definitely fits the bill for me. Painting-wise, I wanted something using a palette of browns less orange-y than the studio version. While the first few stages of painting were ad hoc and slow, once I had painted the leg straps and the ropes, the rest was finished quite quickly. 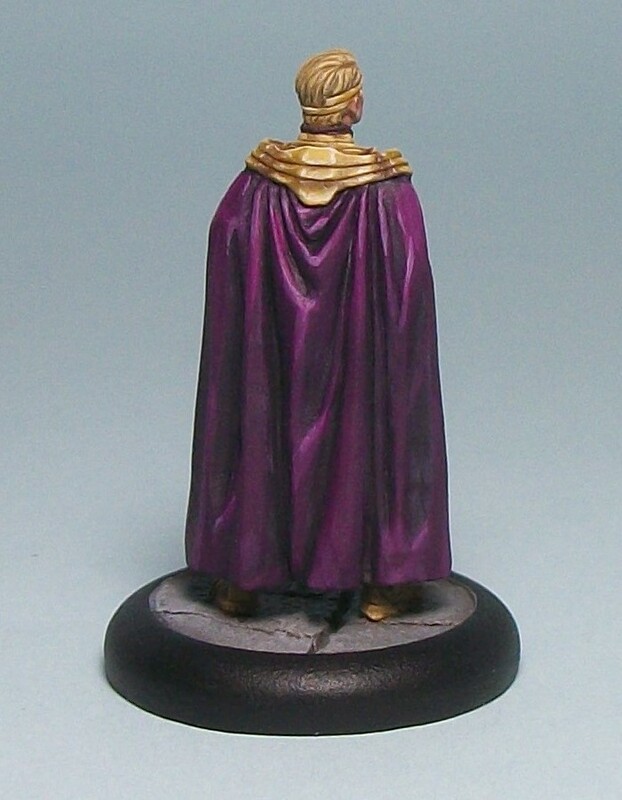 It is nice to get another mini painted, and I very much have the tournaments I have been attending recently to thank for that increased impetus. It has been great to play new players at a new (for me) game, knowing that I should have more opportunities to do so in future. The reason I pressed ahead with Scarecrow was to get a replacement in for the Riddler. 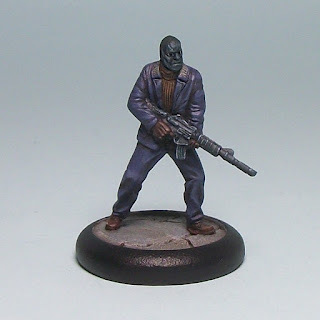 I included Riddler in my Black Mask crew mainly for 'game management' purposes - the non-Damaging stuff - which he is very good at, but the down-side was that on his own his combat capabilities are pitiful. This version of Scarecrow offers some game management (but maybe less than the Riddler) through his Persuasive, Psychologist and Undercover Traits, coupled with a de-buff template attack (more game management) and a 1 Blood close combat weapon. With 4 Attack he presents a threat in a couple of ways, and could be used to potentially finish off KO models if he works as I think. Definitely not a front line fighter, but potentially a useful character in tandem with one or two Henchmen, and something to get to grips with, not least as his Effect-based spray attack is functionally different to a Damaging spray since it affects targets automatically; this is is actually explained in the living FAQ and not the main rules which is an unjustifiable oversight IMHO, especially considering it impacted pre-exiting models such as Scarecrow (this one and the Dark Knight version) and Arkham version Poison Ivy. With a Scarecrow crew on the eventual horizon as indicated in the BMG book, I full expect a third Scarecrow mini to be released at some stage to complement this one and the Dark Knight version; it will be interesting to see which way they go for that.